Everyone thinks it would be cool to have a twelve-string guitar. Be honest: who among us can say that they haven’t lusted after the jangly sounds on “American Girl” by Tom Petty or “Turn, Turn, Turn” by The Byrds? Yet, for many guitarists, owning a twelve-string has always seemed like an unimaginable luxury because they can be a tad impractical. Anyone who has ever gigged with a twelve-string knows that there can be intonation problems, tuning issues, and neck dive. Joe Naylor and his team at Reverend recognized this, and they decided to design a reliable, gig-worthy twelve-string that gives you the chime you crave without breaking the bank. 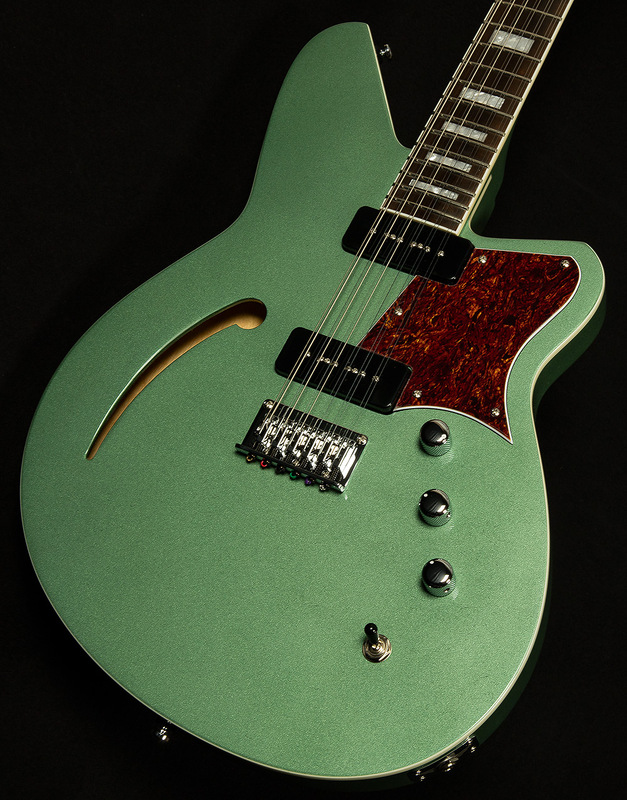 The Reverend Airwave is the result of that quest, and it manages to simultaneously be one of the most practical twelve-strings on the market while remaining incredibly inspiring. Let’s dive in and see what makes it special! But, it’s not enough for this guitar to sound great. In order to live up to the esteemed Mr. Naylor’s vision, it had to be reliable enough to make it through a gig without any hassles or inconveniences. I am happy to report that the Reverend Airwave sports a plethora of features that make life incredibly easy for the player. The most important of these appointments is the twelve-saddle bridge. Having the ability to tweak each string allows for precise intonation, which means that each every chord you play will be more in tune. That level of accuracy ensures that this twelve-string will always chime like a clocktower bell! Speaking of tuning, the Boneite nut and Reverend’s pin-lock tuners give this guitar fantastic tuning stability, so you won’t have to spend forever tuning in between songs. Giving this guitar a 24.75” scale length was an inspired decision, too. It puts less tension on the strings, which makes for a delightfully smooth, slinky handfeel. As long as we’re talking about feel, I have to mention how great the neck is! The 1 ¾”-wide nut is just right—not too wide, not too narrow—and the shape is Goldilocks-approved, too—not too fat, not too skinny. Ultimately, this is the sort of neck that begs you to play for hours and hours, and it feels so good that it will no doubt inspire countless riffs. Reverend has accomplished quite a feat with the Airwave: they’ve managed to design a twelve-string guitar that sounds incredible without sacrificing gig-readiness or reliability. What new ideas will they bring out of you? The possibilities are endless, so we invite you to experience the magic of the Reverend Airwave and find out!